A bar? Or a polling station? A man rushes in at ten to eight and asks the people that preside over our election table if he can cast his vote here. But he is not registered at our table. In fact, not even in this polling station. We ask him in which street he lives and then all we can do is tell him he should find his own station at the other side of the bridge. Where exactly? We have no idea, but he has 10 minutes left to find it before this Election Day is over. He runs out. In the previous 9 hours my table has seen all my neighbors drop by. I join in the afternoon, as a representative of a party to oversee the process (apoderado/a) and to assist where necessary during the casting of the vote and the count. If I see something incorrect, I should comment but I am not allowed to intervene or sign. I cannot say I am very active politics-wise, but I am a great fan of democracy and this is the ultimate chance to assist until the very end, something I have never done before. So I volunteer. The course was given earlier that week by the party: I now know what my duties are as an apoderada and that I am not supposed to pick a fight today, but that I am also not expected to make any friends either. I should be alert, strict, helpful and aware of tricks that the other parties might pull like voting twice, strongly ‘suggesting ‘older citizens on what to vote and to pre-fill the envelopes with ballot papers. Only the other parties do this, of course. So here I am. The presidenta and the two vocales –the assistants to the president– at my table were chosen from the electorate by lottery. Actually, they were elected as spares, but since the first ‘winners’ never turned up, they suddenly found themselves facing an entirely different Sunday. The people that did not show up will receive fine. If there would not have been enough spare people this morning, the first person to cross the threshold to vote would have been obliged to take the honors and spend the entire day in the polling station. So there are now 5 people at my table: the three official ones, an apoderada from another party and me. Slowly a sensation of theatre is sinking in. For ten minutes we try to make clear to an older woman that she can only vote if she shows some identification. Loudly she insists that she has never had to show that during previous elections. We suggest she goes home to find her card and then she may return. She threatens to complain, to call her friends and she declares the entire situation to be a big scandal. One of the vocals tells he is very sorry (‘oh, you WILL be sorry, young man!’) but she will need to come back later with her DNI. She never does. Then the chip of an ID card gets stuck in the computer to register the turnout. The card comes out, but without the chip and the card reader refuses to let it go. The voter will leave with card, but no chip and my table will need to register voters by typing id numbers now. It is good there is just one hour left to go. One of the opposite party members starts to speak with me. I have seen him there during previous elections, always sitting on the bench in the hall with others. We call them the dinosaurs for obvious reasons. Unfortunately he only has a few teeth left and I do not understand a single word. I just nod, smile and hope I have not accidentally agreed to something inappropriate. At a neighboring table two voters try to convince the president to officially register their complaint that the Spanish system to distribute votes is unfair. The president is at a loss: he is supposed to register incidences during the voting process, not concerning the procedure itself. But since he may decide and nobody has been in this situation before, he admits the complaints. Then it is eight o’clock and the doors of the polling station close. The votes received through mail are put in the ballot boxes and the table members now get to vote themselves. After this the first box is opened, the one for the Congreso de Diputados. 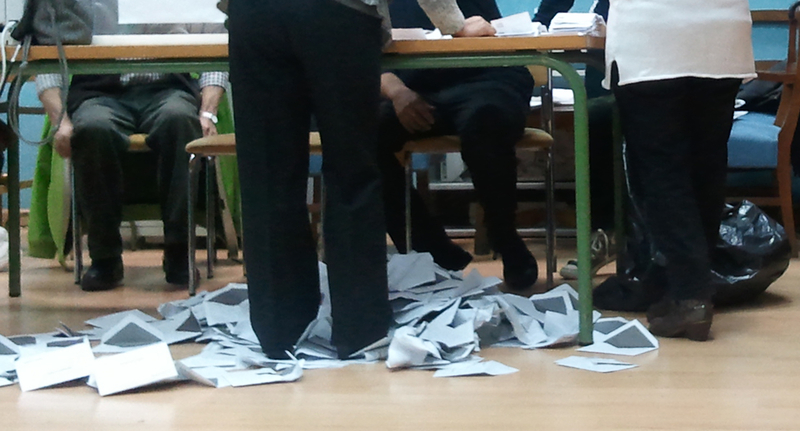 The envelopes are emptied and are thrown on the floor: 397 of almost 600 people have voted. The ballots are all neatly piled with the 2 apoderadas watching the pieces of paper and most of all each other. All well. A particularly filthy envelop gets opened. It looks like it has passed some time under a tortilla because grease is practically dripping out. The contents are a ballot with the comment ‘No hay pan para tanto chorizo’ and indeed, a slice of chorizo. This will be a voto nulo but we all appreciate the originality. It becomes slightly darker when an envelope contains a piece of paper the size of a ballot sporting a picture of Franco and the text’ Traitors I am going to kill you all’. Yes, definitely nulo as well. Even though the table works fast, the counting still takes 3 hours. The formalities and paperwork seem to be endless at this hour, the mountain of empty envelopes resemble an exploded post office. Outside a special van is waiting to take the results to the head office. Results at my table are more mixed than I expected and do not look all that bad for the party I represent today. Many smaller parties have received a considerable number of votes: just one empty envelope and a few invalid votes, that is all. Results for the Senate are tainted by more blank and invalid votes from my neighbors. This is clearly a sore spot. If you want to be sure you are (or will be) registered for the next elections, check here. If you want to assist at a polling station, contact the party you want to represent. You will not need to be a member: a short course and a registration is enough. This entry was posted in Politics and tagged elections 2011. Bookmark the permalink.